This sweet and spicy dish is the ultimate comfort food for many Hongkongers, with its rich soup and chewy noodles. 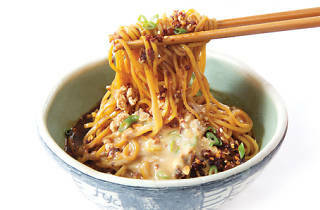 Who can resist a bowl of dandan noodles on a chilly day? Time Out staff noodle around town to slurp up the best bowls of goodness. Rocking a comedic logo and a contemporary, street-feel venue, Dandan seems like the hipster version of restaurants offering this classic dish. Don’t be fooled by the playful nature of the restaurant. Owner Jerome Plassat and his wife, who is from Sichuan, take their noodles quite seriously. They’ve got a secret noodle recipe and everything. 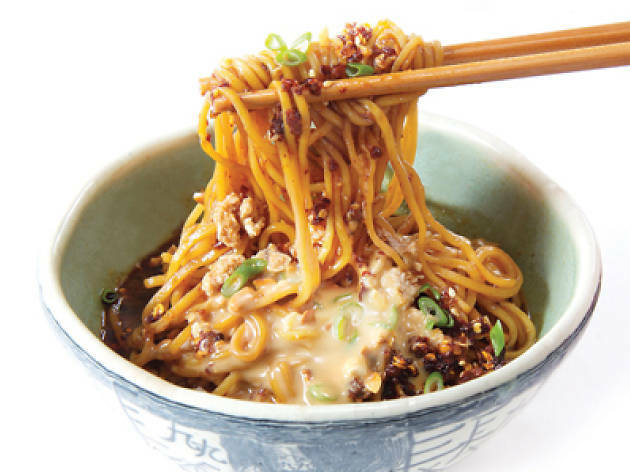 The classic dandan noodles ($55) are served traditionally, though without the usual sesame sauce – instead, they come with an extremely fragrant minced pork and chilli sauce, which is bursting with flavour. 1/F, Low Blk, Grand Millennium Plaza, 181 Queen’s Rd C, Sheung Wan; dandanhk.com. When you think of Din Tai Fung, you definitely think of the top class Shanghainese dumplings. But if you’re a dandan fan, you’ll be happy to know the ‘double D’ noodles here ($33) are definitely worth a try too. Mildly spicy, the thin-yet-firm noodles are neatly rolled and submerged in a thick soup with a strong peanut and sesame base. Garnished with crushed peanuts, the combination is a sweet take on the classic dandan recipe. Shop 130, 3/F, Silvercord, 30 Canton Rd, Tsim Sha Tsui, 2730 6928; dintaifung.com.hk. Owner and head chef Zhang Sheng-hu couldn’t find a way to satisfy his craving for authentic Chengdu delicacies, so he decided to take matters into his own hands by opening Sichuan Cuisine. Among Zhang's many offerings, the dandan here are a standout. In a break from the norm, the noodles are flatter and thicker. The chewiness accompanies the strong flavours of the dandan sauce made with peppercorn, sweet bean sauce, vinegar and other spices seamlessly. You’ll be coming back for more in no time! 8 Kwong Wa St, Mong Kok, 2310 1118; facebook.com/sichuancuisine2014. Serving dandan noodle lovers for over 60 years, this rustic restaurant is hands down Hong Kong’s most famous eatery for the golden bowl of goodness. The noodles are all handmade and the broth is brewed fresh daily using a secret recipe of spices, vinegar, sesame sauce and pork bone. Two options are available here: the signature ($24) and the improved ($34). Both options use the same soup base with customisable spiciness; the only difference is that the improved version is larger and has minced meat – perfect for those with a big appetite! Shop 102-103 & 105, Site 8, Wonderful Worlds Of Whampoa, 7 Tak On St, Hung Hom, 2320 6430; winglaiyuen.com.hk. This restaurant, which is tucked away in the basement of K11, serves up some pretty awesome dandan noodles ($52) that even the staunchest of foodies rave about. The portions are big and the soup is worthy of a good slurp. Just one sip and you'll experience a mix of hearty flavours and spices gleefully dancing on your palate. And, if you’re into stronger flavours, Xia Fei can hook you up. Shop B226-B227, K11, 18 Hanoi Rd, Tsim Sha Tsui, 2801 6111; xiafei.com.hk. With an exciting twist on the iconic dish, Xi Yan offers up a unique dry dandan ($60, pictured). The noodles are cooked al dente and are the perfect texture for this flavoursome dish. With a heavenly creamy peanut sauce atop quality minced pork, this is a refreshing take on a dish that has been done time and time again yet one that retains the classic flavours we all know and love. Shop 1, G/F, 8 Wing Fung St, Wan Chai, 2833 6299; xiyan.com.hk.